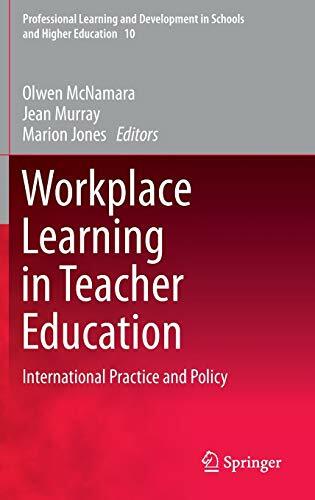 This book explores teacher workplace learning from four different perspectives: social policy, international comparators, multi-professional stances/perspectives and socio-cultural theory. First, it considers the policy and practice context of professional learning in teacher education in England, and the rest of the UK, with particular reference to professional masters level provision. The importance of teachers' and schools' perceptions of improvement, development and learning, and the inherent tensions between individual, school and government priorities is explored. Second, the book considers models of teacher workplace learning to be found in international research and practice to explore what perspective they can bring to understanding policy and practice relating to workplace learning in the UK. Third, it draws on cross-professional analysis to get an intellectual and theoretical purchase on workplace learning by examining how insights from across the professions can provide us with useful perspectives on policy and practice. The analysis draws particularly on insights from medicine and educational psychology. Fourth, the book cross-fertilises research and practice across the field of education by drawing on insights from perspectives such as socio-cultural and activity theory and situated learning/cognition to discover what they can offer in analysing the theoretical and pedagogic underpinnings of teacher workplace learning. In short, the book offers a number of contexts for exploring how best to conceptualise and theorise learning in the workplace in order to generate evidence to inform policy and practice and facilitates the development of a more theoretically informed and robust model of workplace learning and teaching.